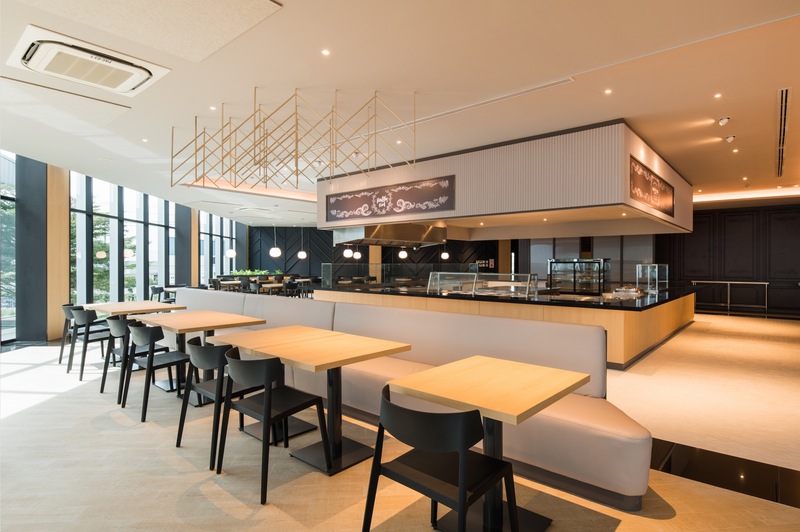 Our client has set their sights on rehabilitating and renovating the entire environment around the Plasess Ayutthaya Factory, for which we have taken charge of the interior re-design and renovation of the canteen space on the second floor of the Canteen Building. 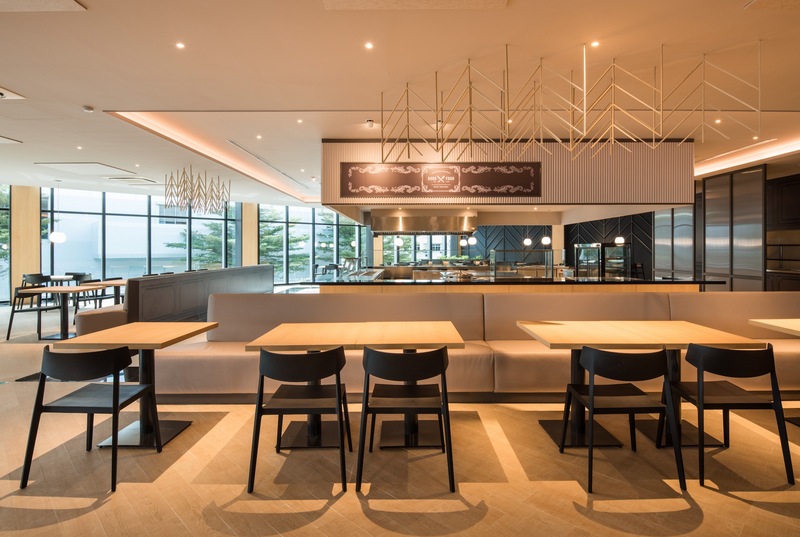 Our client has emphasized the requirement of turning away from conventional designs of most canteen spaces but rather put forward a more calming atmosphere worthy of sitting down and letting go one’s mind, yet have a cool and stylish streak within the space; a challenging exercise that we have accepted. 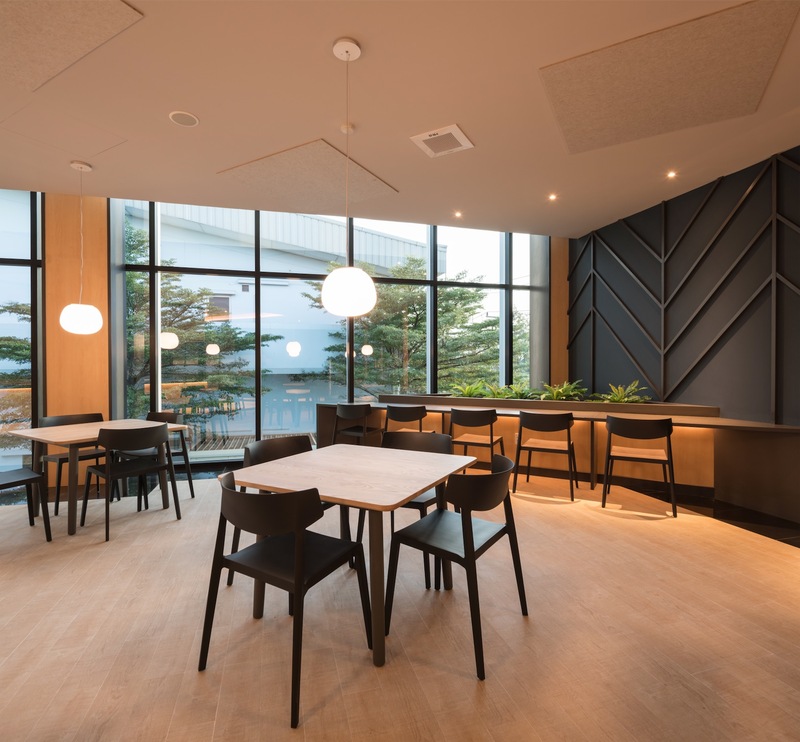 With dense foliage of the forest as the motif image, the branches and leaves are abstractedly translated into the herringbone patterns strewn in dark blue across the room walls, reinforced by the lighting experience on the dark blue walls and floor where shadows casted smoothly shift with the change in lighting condition, skillfully impacting the users all across the space. 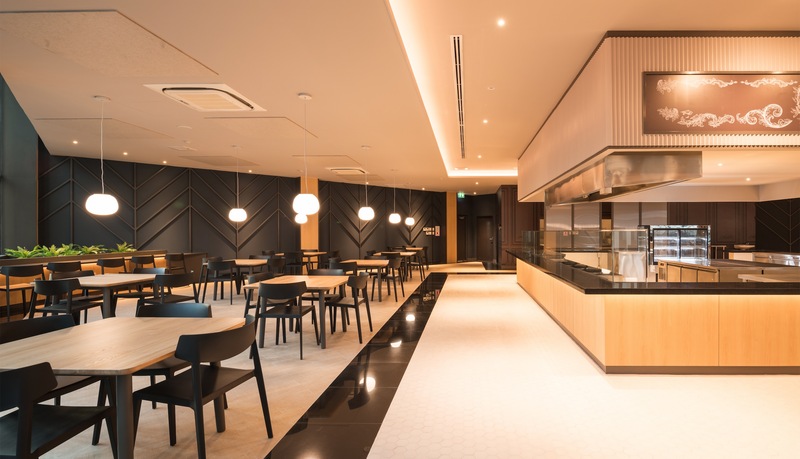 When applying with the grainy wood texture, the same motif exhibits the traditionally used symbol of rice stalks, further contributing to the mood of this space as a place to eat. 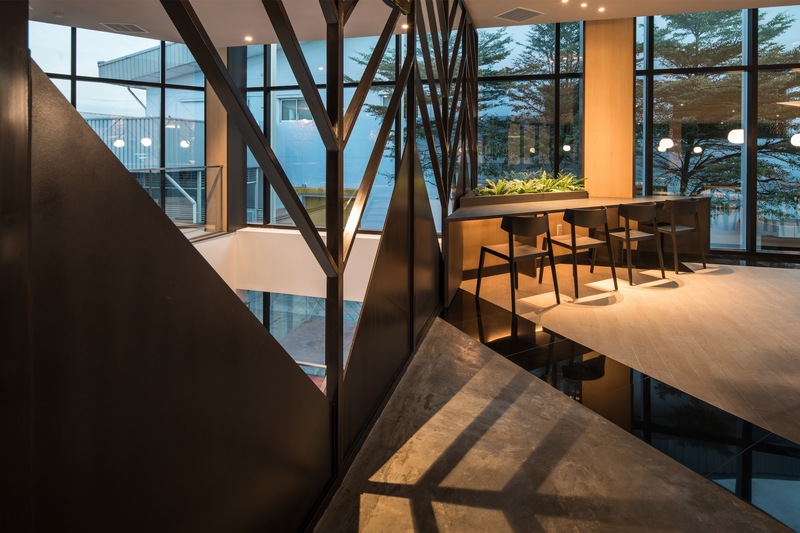 Far away from the glass curtain wall, darker tones have been incorporated such that natural illumination effects from the sun can be felt and culminate in a calming space where users can sit down and compose themselves. 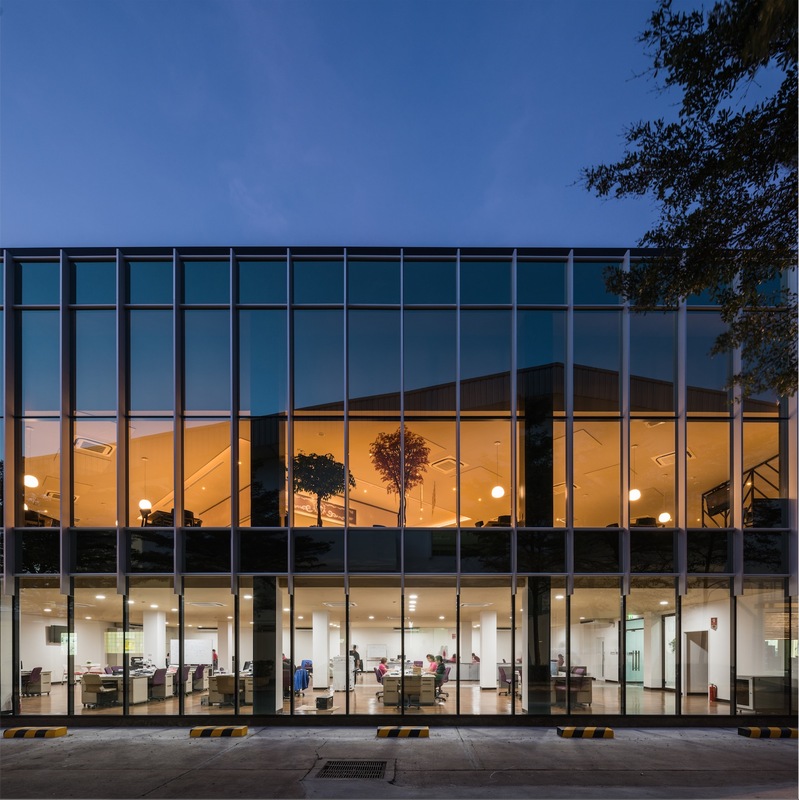 In contrast, the users sitting on counter seats alongside the curtain wall can fully experience the change in daylighting and immerse themselves fully with their release of work tension. Such a contrast in experience is a worthy target to achieve in our design. 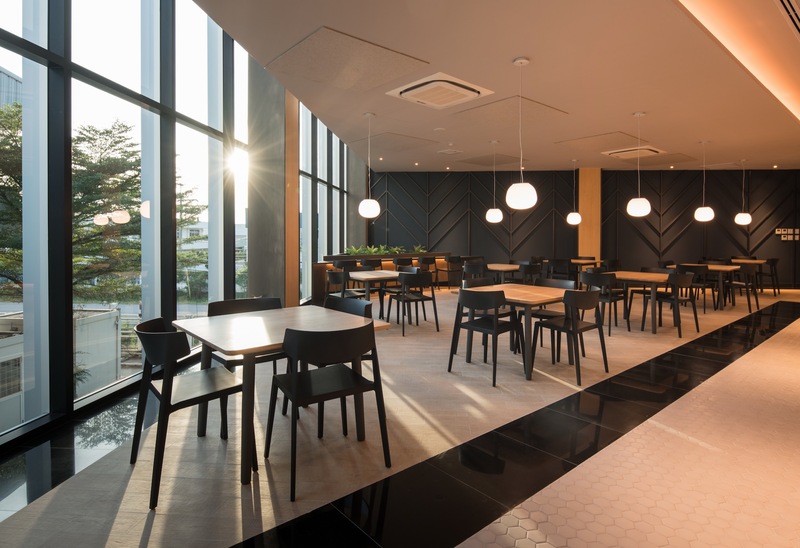 Furthermore, as the Canteen itself is a much frequented facility which is used by staff members from morning till late into the night, we have therefore not neglected the lighting experience for this space after sunset. Client : Plasess Hi-Tech Co., Ltd.
Collaborator : Thai Fukuda Co., Ltd.